As stated at the November and December Village Board meetings, the Village municipal water system continues to meet and exceed all County, State and Federal standards for public health safety. If that was not the case, the Rensselaer County Public Health Department would intervene immediately. At the request of a residential water user, the Village water department sent pre-treated samples taken from each of the 3 wells for non-required chemical testing. This initial sample revealed what appears to be a synthetic element present in the pre-treated well water. This was considered a base-line sample and a 2nd sample has since been taken— including a post-treated sample. The results of the initial test are mixed—but also encouraging—as the results verify that in 2 of the 3 wells, the numbers fall within and under the EPA guidelines of 200-400 nanograms (or parts per trillion) for the element perfluorooctanoic acid (PFOA). The primary well currently being used samples at less than 200 nanograms or ppt. Samples—both post and pre-treated— will continue to be taken as the Village monitors the situation. Neither the County DOH, the State DOH, nor the Federal EPA has set minimum standards for exposure to this element. The EPA is in the data collection phase only. * Since the EPA has not established allowable standards, it does not require such testing of municipal water systems. As mentioned, the element is called PFOA, and is present in many forms of plastic, certain types of clothing, surface coatings, food packaging, and has been found in soils and ground water globally. Communications continue directly with the County Public Health Department and their direction will be followed. There have also been communications with the engineers who designed and installed the Village Water Treatment Plant. Consultations have been initiated regarding the filtration system as carbon filters are known to be effective in screening out this element. The current filters are state-of-the-art poly filters which include carbon filtration. We will be monitoring their effectiveness for this chemical. Obviously, it is un-nerving when the public water supply is questioned. Understandably, there is some misinformation and some valid concerned speculation "on the street". The Village is following the regulations and oversight provided by the County, State and Federal authorities and will continue to provide safe drinking water and keep the community informed. * In a letter to the Village dated 11/25/2015, the EPA has disputed this wording and asked that it be removed. In accordance with full-disclosure, the statement will remain, but the public should be aware that EPA has established a provisional health advisory for PFOA at 400 parts per trillion [per liter of water]. Peer Review of Health Effects Documents for PFOA and PFOS. 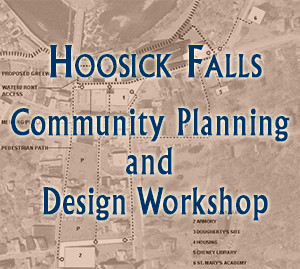 Hoosick Falls Mayor David Borge is extending an open invitation for local residents and business owners to participate in a Community Visioning and Design Workshop to be held from 6:00pm to 8:00pm, Wednesday, December 3, 2014, in the Rensselaer County Senior Center at 69 Church Street, Hoosick Falls, New York regarding the Village of Hoosick Falls Code Update Project. The purpose of the meeting is to allow members of the community to participate in hands-on planning and design activities related to the Zoning Code Update. No technical expertise is required of public participants. All the graphic art supplies required for the workshop will be provided by Barton & Loguidice, D.P.C., consultants on the project. Base mapping of the Hoosick Falls area will be generated in multiple forms and will be provided to each working group. A summary of the results of these Community Planning Workshops will be presented at a later date to the public, and attendees will have the opportunity to review and comment on the ideas presented. This project, funded by the Village of Hoosick Falls and the Hudson River Valley Greenway, examines the village’s zoning code as it currently exists and will recommend changes in its terms and organization to improve the functions of the Planning Board, Zoning Board of Appeals, and Code Enforcement Department. The recommendations will allow for more clarity in the development process for potential developers while also allowing the Village the ability to encourage compatible development projects. Items to be examined include: existing recommendations and plans; existing zoning; comparison of non-conforming use and building code sections; zoning code comparisons; and revisions the zoning code in a way that simplifies. The Hoosick Falls Zoning Advisory Committee and consultants have identified a number of existing “code barriers” and have begun to evaluate solutions. For example, several solutions to so-called “zombie properties”, as-built non-conforming properties, design guidelines as an alternative to use regulation, and mixed-use development are under consideration. The public engagement portion of the project began with a public information meeting in October and continues with this public visioning workshop. A final report of recommendations will be delivered in January or February 2015. Afterwards, recommendation may be adopted by the Village Board following the State Environmental Quality Review (SEQRA) process. The Hoosick Jr. Raiders football team completed a perfect 8-0 season on October 26th by beating Cambridge 27-7 in the Jr. Super Bowl. We are proud of what the boys, their coaches, and the cheering squad were able to accomplish this year, and look forward to supporting them on the new field next year. Go Raiders! The community is invited to Brown's Brewing Company's new Walloomsac Taproom this afternoon for their grand opening celebration. The celebration includes welcoming remarks from Hoosick Falls Mayor David Borge and Town Supervisor Mark Surdam and a Blessing of the Bar by Reverend Tom Zelker, Pastor of Immaculate Conception Parish in Hoosick Falls. Mayor Borge and Reverend Zelker will join co-owners Garry and Kelly Brown to tap a special cask of Brown's Cream Ale and share in a toast with attending guests. Brown's Walloomsac Taproom will be "officially" open to the public for regular business with this momentous occasion. The new retail space which includes a 56 foot reclaimed hardwood factory floor bar will be open Wednesdays through Fridays from 3pm until 9pm as well as Saturdays and Sundays from 12 Noon until 9pm. Brewery tours will be available on Friday evenings and weekends. Visitors will be able to buy pints of Brown's beer at the bar as well as growlers and bottled beer to go. The opening of Brown's Walloomsac Brewery marks the culmination of an eight year build out of a renovated 19th century paper mill on the Walloomsac River in North Hoosick, New York. Brown's built out the Walloomsac Brewery to serve it's growing wholesale bottled and keg business and offer a base for visitors to experience Brown's brand at the source. Brown's Brewing Company was founded in 1993 by Garry and Kelly Brown in an abandoned block of warehouses on River Street in Troy, New York. Brown's popular Troy Taproom is one of the largest brewpubs in New York State and their River Street location is also home to Brown's Revolution Hall private events venue and Brown's Malt Room cask conditioned ale and cocktail bar. Here in our little corner of the region people have been working passionately to promote what we have, and convince others that this is a great place to live, and start a business. From everyday-people behind the scenes, to our elected officials, to our community groups like HAYC3, and CiviCure, to the Hoosick Rising initiative, every effort is having a positive impact and it's starting to show. Stories in the Eastwick Press, The Bennington Banner, The Manchester Journal, The Rensselaer County Chamber newsletter, The Hill Country Observer, and the Albany Times Union are showing that people are taking notice of everything we offer now, and recognizing our greater future potential. 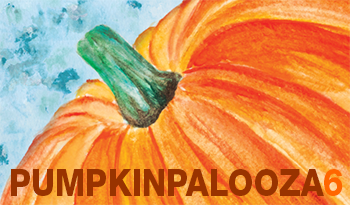 HAYC3 (Hoosick Armory Youth Center and Community Coalition) announces the schedule for Pumpkinpalooza6, happening September 27, 2014. This year’s celebration features family-friendly events throughout the day and in several locations in the Village of Hoosick Falls. The day starts off with a pancake breakfast hosted by the Girl Scouts, and a 5K in memory of Rolf Sternberg. Other favorite events return such as the pumpkin chuckin’ demo and wagon rides. Additionally, the tractor & agriculture show will be held in Wood Memorial Park, and the Louis Miller Museum will be open. Also in wood park there will be music and dance performances, including the Twirlettes. The Hoosick Falls Central Jazz Band will play in Wood Memorial Park too. Additional events include wagon rides, geocaching, medieval combat demonstration, contests, and more. The Hoosick Falls Police Department will be on hand with Mickey the police dog for a meet and greet. A new event this year is a human foosball competition happening at the Town athletic fields. For a full schedule of events and locations, as well as information on registering for events such as the chowder cook-off, human foosball, and the pet parade, visit the HAYC3 website. Hoosac Helps was back in action last week. The "triangle" at routes 22 and 7 which has the landscaping and sign that welcomes visitors to our area was in rough shape. The weeds had become overgrown and the sign was in disrepair. 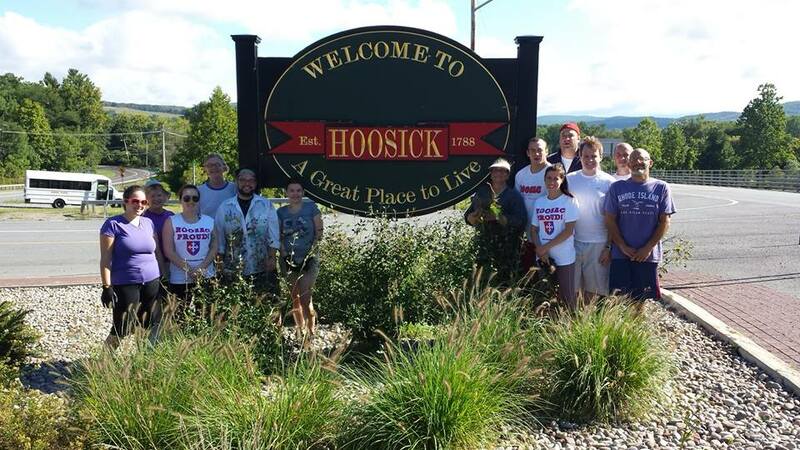 The faculty of Hoosac School made quick work of it and pulled out over three pick-up truck loads of weeds and spruced up the sign. Just in time for leaf peepers to admire! SCA Members to Build Trails at Bennington Battlefield. To commemorate 9/11 and the 20th Anniversary of AmeriCorps. From September 10th-12th, 40 young adults will volunteer 3 days of their time to build trails and restore wildlife habitat at Bennington Battlefield State Historic Site. These volunteers are full-time Student Conservation Association AmeriCorps members who have committed 10 months of their lives to serve the local communities of the Hudson Valley. 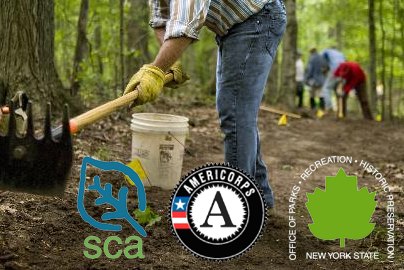 Members Laura Sears and Deb Brzozowski are full-time AmeriCorps members with New York State Parks who have organized the project and will be hosting the other 40 SCA AmeriCorps members for the event. The Bennington Battlefield project consists of 3 miles of trail construction, trail marking, and invasive plant removal. On Thursday, September 11th at 8:30 am, the day will begin with a few words from Alane Ball Chinian, Director of the Saratoga-Capital District Region of OPRHP. SCA and AmeriCorps members will formally dedicate their service in remembrance of 9/11 and observe a moment of silence. On September 12th, they will then take the AmeriCorps pledge to commemorate the 20th anniversary of AmeriCorps service opportunities in New York State and around the country. Bennington Battlefield State Historic Site is owned by the New York State Office of Parks, Recreation, and Historic Preservation (OPRHP) and operated by Grafton Lakes State Park. It marks the site of a pivotal Revolutionary War battle dating back to August 1777, and referred to as the “prelude to the turning point” at Saratoga. The site now offers a bicentennial monument, interpretive panels, an overlook, a picnic area, and restrooms. As Bennington Battlefield lacks an existing trail construction crew, this service project is an invaluable benefit to residents of the surrounding communities and visitors to the battlefield. It is the mission of OPRHP to serve the residents of, and visitors to, New York State by providing year round opportunities for recreation and for appreciation of its natural, cultural, and physical resources while operating the park in such a manner as to preserve and protect those opportunities and resources. The trail system will give site visitors and local residents the opportunity to more deeply explore this incredible cultural resource. The SCA and AmeriCorps members will provide services to Bennington Battlefield and the local community in a three day period that would otherwise take several years to accomplish. You can follow the progress of the project by visiting the SCAHVC Facebook page and following them on Twitter—@SCAHudsonValley. AmeriCorps is administered by the Corporation for National and Community Service (CNCS), the federal agency for service and volunteering. CNCS annually engages more than five million citizens in service at more than 60,000 locations in 8,500 cities across the country through AmeriCorps, Senior Corps, and other programs. National service participants address the most pressing challenges facing our cities and nation, from educating students for the jobs of the 21st century and supporting veterans and military families to preserving the environment and helping communities recover from natural disasters. The Barn Quilts are Ready for the Big Reveal! The Hoosick Barn Quilt Project is on the verge of becoming the Hoosick Barn Quilt Trail and HAYC3 is getting ready to celebrate big-time! Twenty-one 8'x8' barn quilts and six 4'x4' barn quilts have been delivered to their permanent homes and are about to be installed. From East Hoosick to West Hoosick, from the village of Hoosick Falls to Breese Hollow and South Hoosick, you will be able to follow the official map and see these beautiful Barn Quilts all over town. Along the way, you will also witness breath-taking landscapes, barns and historic buildings. Join HAYC3 on Saturday, August 30th from 10:00am-12:00pm at the HAYC3 Armory for the Hoosick Barn Quilt Trail unveiling and celebration of our community. The event will be jam-packed with exciting quilt-related happenings and activities. Get your free trail map and explore among the first explorers to follow the Hoosick Barn Quilt Trail. This event is free and open to the public. Everyone is invited to this big community event. The celebration starts with a “Meet the Barn Quilt Artists” reception. Before or after you head out on the Trail, you can view exhibit of exquisite hand-made quilts (some for sale) by local and regional quilters in 120gallery90. Beginning at 10:00, experienced quilters will be demonstrating different kinds of quilting techniques like English and other methods of paper piecing, accu-quilting, hand quilting, applique, and more. You’ll see a step-by-step how–to on how a quilt is made, from choosing the right colors to cutting the pieces, to putting it all together and finishing techniques. Martha Von Shilgen will provide lively entertainment. Her fiddling repertoire includes jigs, reels, hornpipes and waltzes, all with an old-time feel. At 11:00am, HAYC3 presents a lecture called “Underground Railroad Quilt Signals”. Russell & Noreen Hinton of Newport, Vermont will share their interest in this fascinating topic. They will bring a sampler quilt they have made together which depicts 16 of the patterns commonly in use during the period when there was slavery was in the south. What did quilt patterns and runaway slaves have in common? They shared a secret, a secret so guarded that only recently has it been shared with the world. Unable to read and write, or communicate openly about escape plans, the slaves turned to everyday objects so common they could be displayed anywhere anytime without arousing suspicion. The quilts were used to communicate hidden messages to runaway slaves traveling north towards freedom. The Hintons will share the secret meanings of the Underground Railroad quilt code that was used to convey those messages. Noreen has combined her love of quilting with an interest in history to create a quilt containing 16 of the patterns used during the time when slavery was common. Using reproduction fabrics from the Civil War era adds authenticity as the tale of the Underground Railroad Quilt Code is told. There will also be a Poker Run that day. A poker run is an event in which participants, in riding any kind of vehicles must visit five checkpoints, drawing a playing card from a paper bag at each one. On the day of the unveiling, the checkpoints will, of course, be at Hoosick Barn Quilt locations. The objective is to have the best poker hand at the end of the run. Winning is purely a matter of chance. The fee to enter the Hoosick Barn Quilt Poker Run is $20 for the driver and $10 for each passenger. The prizes are the same as our Texas Hold'Em tournaments, based on entries. You don't have to be a poker aficionado to participate; you just need a vehicle, a sense of fun and adventure, and a desire to help a worthy cause. Participants should meet at the HAYC3 Armory to pick up details of the route and the stops they need to make. At each designated stop, the participant will draw a card at random and the winner of the event is the participant who makes the best five-card poker hands at the end of the event. Prizes will be awarded for 1st, 2nd and 3rd place. OK! On your marks, get set… go! 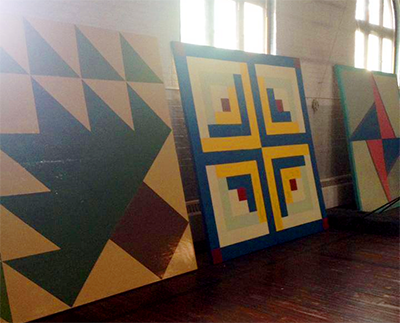 The Hoosick Barn Quilt Project's importance to the community is obvious. It will help beautify both the town and the village for locals as well as encourage tourists to follow the “trail” and discover Hoosick's beautiful landscapes and farming traditions. New visitors will come to the village and support local businesses. Even more important is that it is a community project that has successfully brought our already supportive community together. HAYC3 has partnered with Northeastern New York Cystic Fibrosis Foundation in this endeavor. So, put Saturday, August 30th on your calendar. 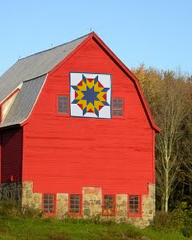 Come experience the Hoosick Barn Quilt Trail and celebrate community and art in our town. For more information, visit the HAYC3 website, call 518.686.9050 or email. History Comes Alive in Hoosick! On August 16th, 1777, in a small hamlet called Walloomsac, a rebel force of roughly 2000 men under the command of General John Stark, decisively defeated a detachment of Germans, loyalists and native allies. This action diminished General Burgoyne’s army by 1000 men, prevented the capture of important supplies located in nearby Bennington, VT, and set the stage for the American victory at Saratoga. 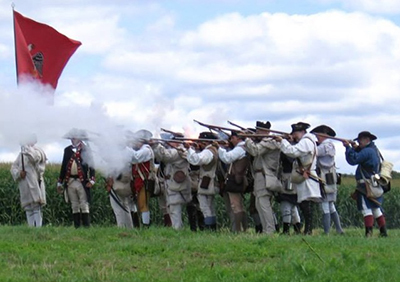 On August 16 & 17th, 2014, on the very ground where it happened, the nationally renowned living history organization the “Brigade of the American Revolution” will commemorate and reenact this pivotal event. Authentically attired and equipped living history enthusiasts will bring to life the actions that took place 237 years ago to the day. In addition to the tactical reenactments, a full and exciting weekend of activities is scheduled. Visitors are encouraged to tour the camps and experience the sights and sounds of 1777. The Battle of Bennington State Historic Site is located on Route 67 in Walloomsac, NY. The camps will be situated at the Barnet Homestead off of Cottrell Road, and will be open to the public from 11:00 to 3:00 pm both days. 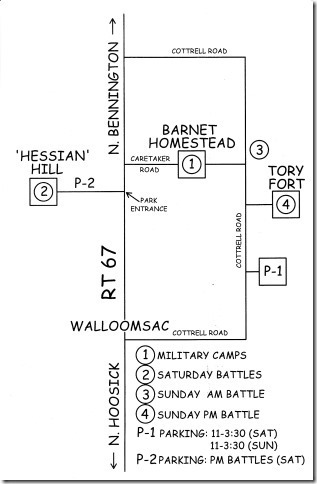 Saturday’s reenactments of the storming of the “Dragoon Redoubt” and the repulse of Breymann’s relief force will take place on the northern side of Route 67 at the top of the so-called “Hessian Hill” beginning at 4:00 pm. Sunday’s reenactments, including the Battle for the “Tory Fort” will take place on the southern side of route 67, adjacent to the Cottrell farm. All programs are free. Watch history come to life as the Brigade of the American Revolution recreates this turning point in our war for independence. 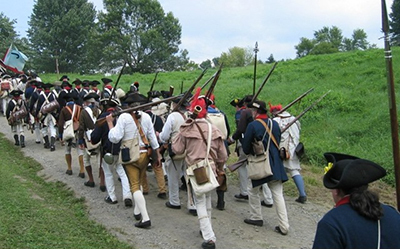 One of the unique activities planned for the Brigade of the American Revolution’s Battle for Bennington event will be the recreation of a section of Colonel Nichols’ flanking march. This march was part of a two pronged pincer movement initiated by General Stark to envelop the Brunswick Dragoons in their barricade on “Hessian Hill”. As part of its educational mission, the Brigade of the American Revolution is inviting members of the public to join the march, alongside authentically dressed and accoutered interpreters. It’s a rare opportunity to get a first-hand taste of what it was like to be part of this historic military action. The hike is free, but is limited to 15 able-bodied participants. For further details, and to reserve a spot, please contact Peter Schaaphok at dragoon@taconic.net or 518-369-0910 by Wednesday August 13, 2014. The camps will be situated around the Barnet House on the south side of Route 67, but please note that Caretaker Road will be closed. Public parking will be on Cottrell Road; see attached map and look for the signs. (Limited parking for those with special needs will be available near the Caretaker Bridge.) Saturday afternoon’s battle reenactments will be at the State Park on the north side of Route 67. The public should park along the main driveway to the State Park. At the recent Hoosick Rising meeting it was announced that Sequence Development of Troy, NY has entered into an agreement to develop the vacant lot where Dougherty's once stood. 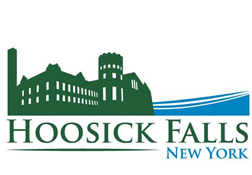 Owner Jeffrey Buell and other representatives from Sequence attended the meeting and spoke briefly about the project, and how pleased they are to be part of the re-energizing of Hoosick Falls. Mayor Borge has been working with Empire State Development to insure that the $750,000 grant that was secured for the redevelopment by the previous administration is still available. Firm details are forthcoming, but the proposal is to build a new 3-story mixed-use structure on the vacant lot as well as develop the adjoining property at 5-7 John Street. 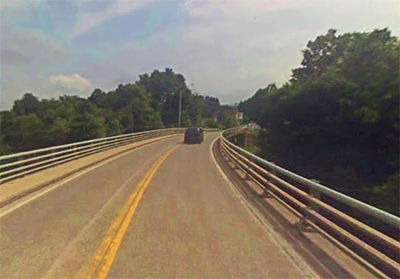 The Village was recently notified by the New York State Department of Transportation (NYSDOT) that the River Street Bridge will be repaired starting in the fall of 2014. Work is anticipated to be completed by the end of the 2015 construction season. The project will include steel repairs, replacement of most of the bridge's joints, some full-depth deck repairs, fascia repairs, and application of a waterproofing membrane with asphault overlay. In order to provide a safe work area, it is anticipated that NYSDOT will reduce traffic to a single lane, alternating traffic with a temporary signal system. All properties in the vicinity of the bridge will remain accessible to residents and emergency responders while the work takes place. There will be no nighttime work. On Saturday, July 26th at 7:00pm, Metropolitan Opera Star Oren Gradus will present a concert of arias and show tunes at the Hoosac School to benefit CiviCure. CiviCure is a Hoosick Falls non-profit organization driven by the mission of community revitalization through active stewardship of Hoosick's rich heritage and rural environs, and the various art forms inspired by them. 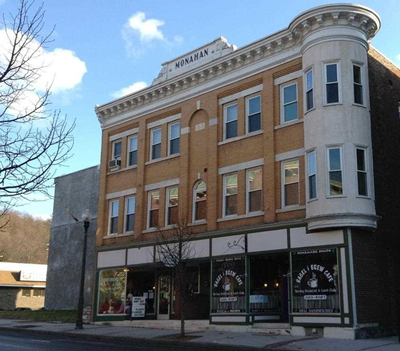 Gradus' performance will support restoration of the live performance space in the Wood Block Building at 5 Main Street, where traveling and local artists once graced its two stages. Oren Gradus, whose rich bass voice has been lauded as "full-bodied and sensitive", has appeared in some of the world's greatest opera houses. Notable venues in North America include New York's Metropolitan Opera, San Francisco Opera, Houston Grand Opera, Washington National Opera and the Canadian Opera in Toronto. European appearances include Teatro Communale in Bologna, Opera Marseilles and the Liceu Opera House in Barcelona. Gradus can be seen in the Great Performances at the Met broadcast of La Bohéme, televised by PBS affiliates on Friday, June 27 at 9:00pm. Joining Gradus is lyric soprano Mariona Pallach, from Catalonia, Spain. A graduate of Barcelona Conservatory, she is an award-winning vocalist and voice instructor who has sung feature performances on the premier stages of Spain. In addition to singing arias, show tunes, Pallach will also perform music from her native land. The singers will be accompanied by Jennifer Peterson, a gifted pianist, opera coach, and accomplished conductor. She is the founder and director of Operamission, based in New York City. The concert is hosted by the Hoosac School which is celebrating its 125th year as an independent preparatory school in Hoosick. Reservations include a 7:00pm reception with hors d’oeuvres on the East Lawn of the Tibbits Mansion, with its sweeping views. The concert begins at 8pm in the auditorium. Afterward, dessert and coffee will be served and there will be an opportunity to meet the artists. The Hoosac School is located at 14 Pine Valley Road. Tickets for the event are $20. For reservations by phone please call 518-686-4258 or reserve online or email civicure@gmail.org. See the flyer. 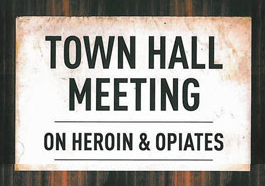 On Thursday, June 5th at 7:00pm, The HAYC3 Community Coalition will hold a second Town Hall Meeting at The Hoosick Falls Armory regarding the recent rise in heroin, prescription drug, and other substance abuse in our community and region. This meeting will feature doctors and other health care workers as well as social workers and will focus on prevention, treatment and resources and services available in our area. Parents, youth, community members and leaders from Hoosick and surrounding areas are encouraged to attend. At the April 23rd meeting several things became apparent. One was that the growing substance abuse problem is a regional issue, not just a Hoosick issue and working with Bennington and other nearby communities will strengthen and benefit all of our efforts. Also apparent was that the people in attendance wanted more information about who and where to turn for help. The upcoming meeting is intended to address both of these questions and more. "The Town Hall meeting is an effective way for community members to engage in the conversation by asking questions and voicing their concerns," said Aelish Nealon, Executive Director of HAYC3. "This community forum will serve as a platform for medical professionals, treatment agencies, local law enforcement, and the HAYC3 Community Coalition to highlight their efforts, and for the public to ask questions." The Hoosick Community and the surrounding area is currently experiencing an extremely dangerous epidemic of heroin and prescription drug abuse by teens and it has been statistically shown to be connected to alcohol abuse in this age group. This forum is intended to teach community members to recognize the signs of abuse and get the needed medical and social services support for friends and loved ones struggling with addiction. The discussion is open to parents, students, community members and leaders from Hoosick and nearby towns and villages. HAYC3 feels that partnerships among communities, particularly Bennington, will make us all stronger. Medical, health care and social work specialists from Rensselaer County, Hoosick Falls and Bennington medical and mental health organizations, as well as other experts, will be on hand to answer questions and offer ideas for ensuring our communities’ members get the support and attention they need and deserve. Panelists include, among others, Trey Dobson, MD, Chief Medical Officer SVHC, Dr. Nels Kloster, an addiction psychiatrist and specialist in addiction medicine, Terra Stone, LCSW, MICA Coordinator, and Eric Katz and Davia Plusch of the Hoosick Falls branch of Unified Services, Rensselaer County Mental Health Department and Harold McClellan, Assistant Chief of Police in Hoosick Falls. 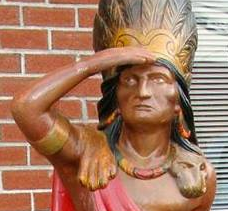 An effort is underway to collect the funds needed to have a replica of Hoosick Fall's own historic wooden cigar store Indian Native American "Chief Poke-In-The-Nose" carved. The chief stood watch over downtown Hoosick Falls for over 70 years, and was often the sidekick in snapshots with tourists and locals alike. A hand-carved replica is expected to cost around $2000. Village trustee Kevin O'Malley has sourced a capable woodcarver and is organizing the fund drive. The Chief was affectionately called “Chief Poke-in-the-Nose” due to a missing nose after an unfortunate fall when he was being relocated. The Chief was a nod to the town’s Native American past (Hoosick means “place of stones” in Algonquin) and a celebrated mascot. Over the years, people traveling through town would stop and take pictures of the Chief and he became a celebrated village attraction. He was also recognized and featured in several high-profile magazines and newspapers like Sunset and The Boston Globe. Chief Poke-in-the-Nose traveled up the Hudson River from New York City and arrived in Hoosick Falls in 1894, where he took up residence in front of the Moses Schweizer Cigar Store at 55 Church Street. The Chief left his post of duty on more than one occasion, but never by his own volition. One unfortunate move resulted in the loss of his nose and right arm, which were grafted back on, but never permanently restored. As a result, it became a daily ritual for residents to stick their fingers through his broken nose—and a nickname was born! In 1932, he was the victim of a kidnapping and later found in a fraternity house on the Williams College campus. He would also leave his post on several other occasions, like Halloween, but he always returned to his post. In the 1960s, the cigar store closed and The Chief left the village—leaving many of the village’s older residents to wonder what happened to this famous figure. It was later discovered that in April 2011, Chief Poke-in-the-Nose was auctioned and sold for $62,150 on Long Island. Efforts are now underway to commission a replica—or a close replica—of the Chief to his rightful place on the sidewalks of Hoosick Falls. Donations can be mailed to The Hoosick Township Historical Society at P.O. Box 536, Hoosick Falls, NY 12090. To follow the progress, follow the Chief on his Facebook page. Art is blooming on John Street! Have you noticed that John Street is looking a little brighter since May 1st? Flower themed art will do that. 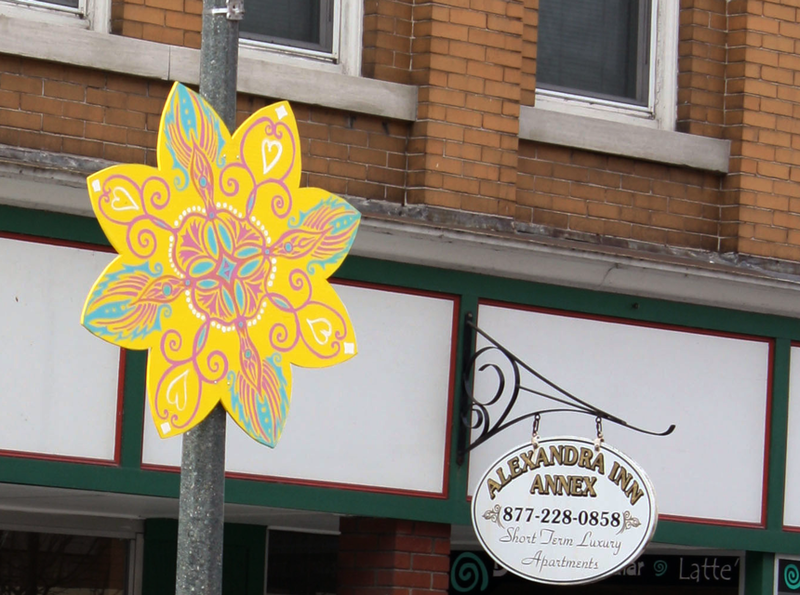 Thanks to The Hoosick Artist Guild for painting the six big colorful flowers and HAYC3’s Aaron Buzzinski for installing them on the lampposts. Special thanks go to True Value Hardware for donating the supplies. Yet another successful HAYC3-organized community project that brightens our vilage and our spirits. Community Spirit Shines on Clean-up Day. 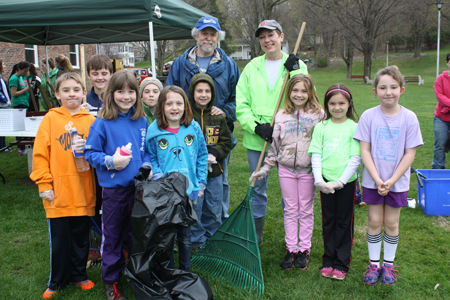 The Village of Hoosick Falls and HAYC3 would like to thank everyone who pitched in to make the annual Love Your Village Spring Clean-up Day a huge success again this year. It was pretty cold for a May day, and drizzly off-and-on, but about 200 volunteers came out anyway to help spruce up the Village. They got 50 Church Street, the Kid’s Community Garden, ready for planting, cleaned up and weeded in Wood Park and at The Wood Block, around our churches and more. They also helped out some of our senior residents. Extra kudos go out to the youth of our community who gave up their Saturday morning to participate with enthusiasm and energy. More than 100 students from Hoosick Falls High School and Elementary School (the third grade especially) were working hard under the guidance of Mrs. Burdick, Ms Ferrinnini and Mrs. Nielson, as well as many families and individuals who came on their own. 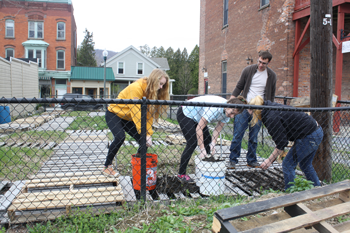 Students from Hoosac School, and St. Mary's Academy were also busy taking care of their clean-up assignments. “Participating in the Community Clean-up is always a great experience because you can physically see the impact you're making in the community. Doing it as the National Honor Society in Miss McGuire's (the late Isabel) name as 'Issy's Crew' just made it so much more special because it's clear how important the community was to her. To be able to give back in a way that would make her proud means the world to us,” said Zoey Haar who was there with the HFCS National Honor Society, all proudly sporting their 'Issy's Team' t-shirts. Also on hand to help out were Mayor Dave Borge, the CEO staff, St. Mark's and All Saints crews, and many individuals from all parts of the Village. Our youngest helper was one and a half years old! True Value Hardware graciously supplied the bags and other supplies. Lots were filled! HAYC3 said they were proud to have worked with The Village, Mayor Borge and Niel Stowell and all the participants to make this event happen. Thank you all… we are community. The Emerald Ash Borer (EAB), is an insect which poses a threat to the ash trees in our region. A large population of EAB is established in southern Albany County to the west, and insects have been found in the purple hanging traps situated in Stephentown and Massachusetts. EAB has killed millions of ash trees in the Midwest since its introduction into the United States. It is estimated that 7% of the trees in Rensselaer County's woodlands are vulnerable ashes, with untold numbers in parks, home and commercial landscapes, and along roads. When these trees become infested and start to die, questions will be raised and action will need to be taken. The dead trees will present safety hazards as well as economic and aesthetic losses. Cornell Cooperative Extension of Rensselaer County, in concert with the Rensselaer County Environmental Management Council, is prepared to help respond to the problem. On Wednesday, April 30, a special program on EAB will be held at the Extension offices in Troy to inform homeowners and the general public about the situation and what can be done. Registration information on this program is listed on their website. 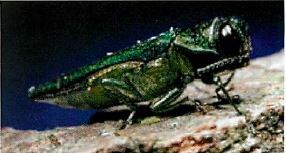 General information on EAB can be found on Cornell Cooperative Extension's invasive species program website. Reach out to the Extension if you have questions about potentially vulnerable trees or a possible EAB infestation in your area. Contact Cornell Cooperative Extension at (518) 272-4210 and ask for David Chinery or email. For detailed information on the Emerald Ash Borer with pictures to identify the species and the signs of infestation, view the information sheet. The Hoosick Falls Central School Drama Club will present “Shrek The Musical” on Friday April 4th, Saturday April 5th, and Sunday 6th. Thanks to the continuing support by the school, the Drama Club continues to offer free admission! In keeping with the 2001 movie, the story follows everybody’s favorite lovable green ogre as he strikes a deal with the scheming Lord Farquaad to rid the swamp of a band of fairy tale creatures. Shrek’s quest: to rescue the fiery Princess Fiona from a dragon-protected tower. Teamed up with the incessantly chatty Donkey, he sets off on what seems to be a simple task, but it will forever change him and the land of Duloc. While the musical has a great deal of similarities with the movie, there are also many differences and surprises. The music is all new, and is fantastic, beautiful, and hilarious. Nominated for 8 Tony Awards, 11 Drama Desk Awards, and even a Grammy, the Broadway show enjoyed a successful run. The show is perfect for all ages: it contains no bad language, is very captivating, and has great messages about love, friendship, and diversity…and it wouldn't be the occasional burp. There will be a brief 20 minute intermission where concessions will be available for purchase in the High School Cafeteria, with all proceeds going back into the HFCS Performing Arts through the student-run Performing Arts Council group. Because the show is aimed at all ages, we had adjusted the start times to work better with the little ones. The performances Friday the 4th and Saturday the 5th will begin at 6:30PM, while Sunday’s start time will be 2PM. If you have any questions, feel free to contact the show’s director Rob Allen at 686-7321 x1106. 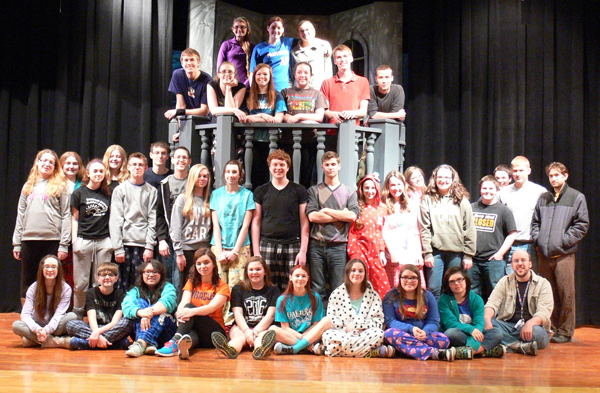 Most of the cast and crew of the HFCS Drama Club. Community Photography Show to Celebrate Hoosick. All Hoosick Residents Invited to Participate. HAYC3 is excited to announce “Hidden Hoosick”, the first-ever Hoosick Community Photography show at 120gallery90 at The Armory. All Hoosick residents are encouraged to participate in this exhibition that opens Friday, June 20, 2014. 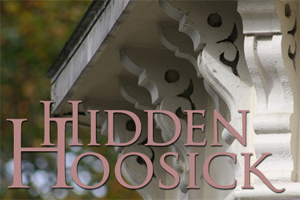 The theme of the community-wide photography exhibit, “Hidden Hoosick”, is meant to celebrate the beautiful, charming, captivating, interesting visual aspects of our community. Some are things or places we see everyday and forget to notice, that we take for granted, and others we need to look a little harder or more closely to find. There are so many beautiful places and things in the Hoosick Community. Sometime it’s the bigger picture – the sweeping hill views, horses running in the paddock, the bend in the river, or a gorgeous village Victorian house. Sometimes it’s in the details, like the gingerbread corbels on a front porch, the pattern and colors of the shingles on a house, the expression on cow’s face, the texture of sheep wool, the gears on farm equipment, or the bark of a tree. Subject matter can be architecture, nature, landscapes, or animals, so long as the photo was taken by a Hoosick resident and was taken in the Town of Hoosick or the Village of Hoosick Falls. The photograph can be wide angle or a close-up detail; it can be one you took recently or a while ago, in any season. Black and white and color photographs are acceptable. So get out your cameras and start exploring…wake up your inner artist and see what you can find that’s photograph-worthy the town, the village, even in your own back yard, house, classroom or workplace. When all put together in the gallery, we’ll have a picture of the essence of our community. The collage of colors, patterns, lines and shapes, the images of Hoosick will be a collective portrait of Hoosick that will be incredibly impressive. And you can be a part of it! Submissions are due to HAYC3 by June 16th, one entry per person please. Photographs submitted for the exhibit should be framed (if you work with standard sizes, frames will be inexpensive) and ready to hang. Photographers must be willing to sell their photographs; the photographers will determine price. Sales will be split 75/25, with 75% of the purchase price going to the photographer. The other 25% will be used to support 120gallery90 and other HAYC3 Arts programs. The Opening Reception is planned for Friday, June 20th and includes music in The Owl’s Nest at The Armory. Both are free and open to friends, family and the public. For complete information, visit the HAYC3 website. 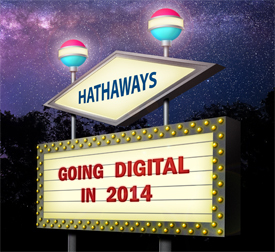 Hathaway's Drive-in Going Digital in 2014. Hathaway’s is pleased to announce that sufficient funds have been raised to allow them to proceed this spring with converting their projection system from 35mm film to digital cinema and open on time for the 2014 season. As long as the weather cooperates, they have chosen Friday, April 25th as their first night. It has been a long journey for Hathaway's, working diligently to accumulate those funds. "We owe much gratitude to our loyal patrons, friends, family, and well wishers from across the country. They purchased field speakers, tee shirts, season passes, raffle tickets, film earrings and attended a fall music concert; all to benefit our cause. And the A Night at the Brewvies event at the Hoosick Falls Armory, which was collaboration between Brown's Brewing Company, HAYC3, and Hathaway's, was a tremendous success." Perhaps the most exciting and fruitful component of their efforts is an agreement they have forged with Lynn Caponera from In The Night Kitchen at Scotch Hill Farm located in nearby Cambridge, New York. Lynn and Maurice Sendak, author of Where the Wild Things Are, created The Night Kitchen Farm. Maurice bought the 150-acre Scotch Hill Farm in the 1990’s. He was drawn to the area because of the nearby Monks of New Skete with whom he had a long-term relationship. Scotch Hill Farm, now owned by Lynn, a long-time Sendak companion and assistant, is a working farm that grows and donates food to local food banks and pantries. Through this agreement, Lynn provided a significant portion of the funds required to convert to digital projection. Hathaway’s will help increase public awareness of the need for hunger relief for children and families in the region by running on-screen public service announcements promoting awareness for hunger relief. "It is a cause we personally believes in, so being a part of it was easy." In addition, Hathaway's will be asking all movie patrons, if they can, to bring a non-perishable food item to the theatre when they visit. Together, they hope to make a tangible impact on hunger relief in our communities while enjoying digital cinema and sound from the new equipment. Hathaway's would like to thank everyone who supported the effort and... "See you at the movies"! THE BARN QUILTS ARE COMING! Sponsored and coordinated by Hoosick’s HAYC3, and more than a year in the planning, the All-Hoosick Community Barn & Building Quilt Project is now underway and moving full-steam ahead. The Barn and Building Quilt Project (which will be the “Hoosick Barn & Building Quilt Trail” when it’s done) is one that strives to unite community through the communal designing, construction, painting of quilt patterns on 8’ x 8’ and 4’ x4’ wooden panels. Everyone’s all abuzz about this project, which is probably more “Hoosickian” than any in recent memory. There isn’t anyone who hasn’t had a friend or family member who quilts, has wanted to learn to quilt, slept under a quilt, or oohed and aahed over their beauty and craftsmanship at a museum, house, antique shop, a craft fair, or an estate sale. Everyone’s getting involved; Hoosick Falls Mayor is on board, the new Hoosick Town Supervisor is excited, and everyone who has heard about it is ready to go. "The Barn Quilts are coming and our community is ready to welcome them with open arms," says Mayor David Borge, "The Hoosick Community is rich in history and tradition. Our citizens appreciate craftsmanship and take pride in our heritage. The Barn Quilts and the trail combine both and I am excited and pleased to support yet another example of the best of our community." Originally planned for last year, the project was postponed because HAYC3 received a last minute, gotta-do-it-now grant for the awesome Owl Mural project last summer. Now the Hoosick Barn & Building Quilt project is happening. Design and building will begin this winter (the first work dates scheduled for building the frames are January 25th, 2014 and February 15th) and will continue into spring, and the painting will happen throughout this summer. It will be HAYC3’s major summer art-for-and-by-the- community project. The plan is to create a large number of the “quilts” this summer as the start of an ongoing endeavor that the community can continue adding to in the future. Together, under the auspices of HAYC3, we will explore the history, purpose and meaning of quilts in the American and regional cultures, and together we will create beautiful painted wooden quilts that will be permanently installed on barns and buildings all around Hoosick and Hoosick Falls, thus creating the “Hoosick Barn & Building Quilt Trail”. There will be a specially designed map indicating the Quilt locations that residents and tourists can follow. The unveiling of the quilts will be in August of 2014, and HAYC3 will sponsor a Hoosick Barn & Building Quilt Trail Caravan in the fall during the peak foliage season. Several counties across the country, mostly in the Mid-West, have created barn quilts and barn quilt trails. Ours will be the first one in this region. As with the others, ours will be a celebration of our agricultural and rural heritage through the warmth and beauty of quilting art, as well as to pay homage to the many quilters that have always been a part of the Hoosick Community. The goals of the project are to celebrate our community’s history and heritage, to encourage artistic expression, promote community pride, to bring generations together to learn and share, to have a good time working collaboratively with our friends, families and neighbors. In addition, the Hoosick Barn & Building Quilt Trail will encourage economic development by promoting tourism and local businesses. Organizations and individuals who are interested in participating in any way, shape or form should call HAYC3 at 686-9050 or email contacthayc3@gmail.com. There are many ways to get involved: as a sponsor, become a steering committee member, help build the frames, designing and/or painting the quilts, apply to have a quilt on your barn, farm structure or building, help hang the finished ones. No matter what your skill or talent, whether you are a quilter, carpenter, painter, or just care about this community, you have something to contribute.